Mixtape 008 sees Leeds based producer Hackman bring a strong 50 minutes of House vibes and a more than decent selection of unreleased gems (almost the entire mix)! Hackman is best known for his work in the realms of UK Funky, having key releases on labels such as PTN, Shifting Peaks and Well Rounded. To anyone that is well read on the UK Funky and Bass Music scene that is taking over the UK at the moment, these labels should be ringing big alarm bells in your head. However, as time moves on we all move with it and it seems that Hackman has left the UK Funky movement to head into the world of House, and when listening to this mix I don’t feel that this is in any way a bad thing. It all seems to be being chucked under the large umbrella genre that is “Bass Music” these days anyway. 50 minutes of incredible music, a large chunk of which was made by the man himself, with near flawless mixing ability, mixtape 008 sits beautifully alongside our more recent mixes whilst still holding it’s own as an individual. I’ve been addicted to this mix for the last 3 days now, listening to it non-stop. 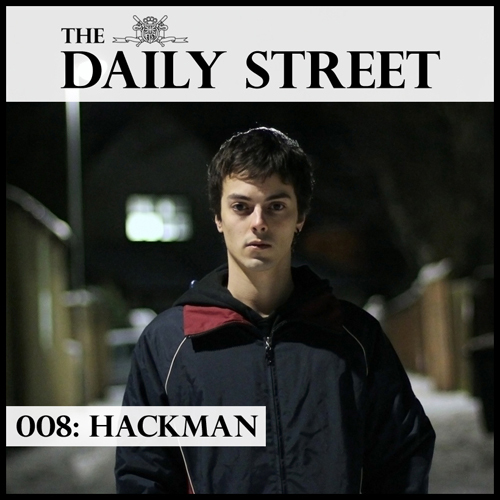 For those that don’t know of Hackman and his work, have a listen and get to know. For those of us that do know, enjoy! Nice one for the heads up! I’ve corrected the tracklist. Tracklist updated again to include track 04 and the remix info on track 13. Any idea of if/when that Skips track might come out?